Here’s the pics from tonights session. Last year was the year of painting, this year is the year of plaything. I’m going to try loads of different stuff and see where it takes me. Really enjoyed the Sumi-e ink and calligraphy brush stuff tonight. Its the first time I’ve tried using this technique. I don’t really know what I’m doing, but that’s kind of the point – its all good fun. Shame the photos don’t show how deep the blacks are due to the flash reflecting. I will do photos better at some point but its always so damn late when I get back on these long thursdays that I just need to get this stuff posted and done. This was meant to be a Konami code easter egg for Adam and Cerys’s wedding website. We got busted. But I thought I’d finish it off anyway. Adam found the blood splat, so that’s not mine, but no-one is ever going to see this so I edited it slightly and used it anyway. I would probably have gone the whole hog with blood and chunky bits spattering against the camera if it was me, but, y’know. Welcome to 2015. Year of… doing stuff. Last year I did a little animated .gif for Simpleweb. We were giving away free websites to our clients. Yep, websites. For free. To our clients. Because Simpleweb are ace. 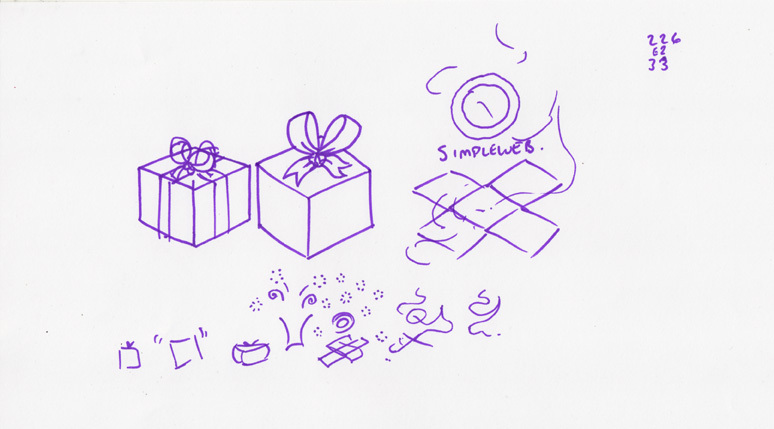 But that was enough to kick off the train of thought: Gifts, presents, opening… whoOOosh – sparkles! This particular little animation was nice. I just shut my eyes in the kitchen (it was important the idea came in the kitchen. They usually happen in the shower or on the loo. Ideas, funny little buggers.) and I could see the animation play through. I can’t remember what the numbers were in the top right. Must be important. Really important. It only took a couple of hours to artwork, build and animate in Flash. Dead quick. Then it took another two hours to work out why the FLA corrupted so badly that it entirely locked me out of my computer. Once I’d gone in through a different user account and somehow re-activated my login, I re-built a new FLA from scratch and rendered the gif through Photoshop. The nerdy animator in me wanted to do a nice ribbon falling down into shot and settling, but I’d spent too much time fighting with Win7 and it was better off keeping it simple anyway. Job done. Finally, life drawing starts again next week so its business as usual in blog town. I’m going to approach this year with 97% more experimentation. I want to do some quicker poses again in different media. Maybe some Big Sumi-e ink sketches on A2 paper, perhaps some outline work with ink pens or brush pens (thanks Mike) and colour them in later. Not really sure. Definitely want to try new things though. 2014 was the year of painting. I want more fun in 2015. Yes. Maybe I’ll go back to drawing more “spooky” twisted stuff as Imogen described it as. Yeah. More weird = more better. Push the boundaries of taste and acceptability a bit.